Sound "CST ICs clear, extended treble" is matched by the TRS's "greater air and detail, but also razor-sharp delineation of midrange and low bass"; "but if you are looking for warmth, it aint here." Features TRS uses "four totally independent, separated, self-contained cables within each speaker cable"; the CST IC uses "pressure-extruded vacuum-drawn 6N copper" and "non-ferrous metal connectors." Use Coincident recommends a very long burn-in period, but Ken found that a month of use did the trick. Value "The speaker cable and interconnects together did perform some magic, especially for their cost." For many of us audiophools, cables represent, along with power conditioning, the final frontier of system tuning. Sure, you can add ultra-super jelly-filled footers, free-floating uranium-enriched pneumatic isolation tables, and a second concrete floor under your dedicated listening room. But cables will make a bigger and more immediate difference, and one that even your spouse, dogs and cats can hear. Though in some audio quarters spending hard-earned bucks on wire is still sneered at, anyone with less than tin ears knows instantly that there is a major difference between a pair of Cardas Golden Reference speaker cables (OK, that's what I use) and standard Monster Cable. Usually, cable manufacturers are a singular breed. They make cables and nothing else. Maybe a power-line conditioner here or there, but that's it. So you have to wonder why Coincident Speaker Technology has jumped into the cable game. Coincidents Israel Blume is a far-sighted man; he has also introduced a 300B tube amp and a power cord to his line of products. 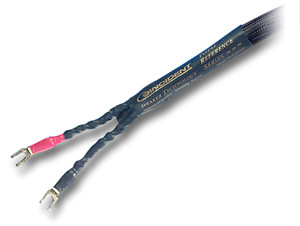 Blume offers the TRS as well the less-expensive CST and CST.5 speaker cables. He also makes the CST IC interconnects. The Coincident website is filled with audio hyperbole: "The Total Reference Series speaker cable is constructed like no other cable and sounds significantly more transparent than any other cable in existence today." Why do manufacturers print this kind of poop? Israel Blume backs it up with pertinent cable-construction info, so try not to get too riled up. The TRS speaker cable is reasonably thick, very unruly (Total Reeling Snake?) and covered in a shiny black mesh. It's terminated with very manly gold spades. The TRS speaker cable features "completely symmetrical conductor construction -- four totally independent, separated, self-contained cables within each speaker cable. The hot and ground of each cable are tightly coiled together." Coincident claims "this technique is responsible for the cable's very low inductance, which translates to very extended and detailed high-frequency reproduction." Also, "the conductors are comprised of three varying gauges of solid-core combined with 252 ultra-fine strands. This construction leads to a cable that is totally phase coherent and frequency optimized. Each of the four cables are double shielded -- Mylar foil tightly wound around the internal dual conductors with a 6N OFHC copper shielded braid wrapped around the entire cable. This elaborate shielding technique is unique to a speaker cable." Finally, "Ultra-low capacitance polypropylene air dielectric insulation surrounds each of the dual balanced conductors for faster signal transfer and more precise transients with no sense of slurring or overhang." eliminate RFI and create a cable of incomparable low noise." It "will outperform virtually all interconnects regardless of price." Coincident sent me the TRS speaker cable ($1095 USD per eight-foot pair) and a pair of CST IC interconnects ($299 per meter pair) and suggested that I burn them both in for a long, long, long time. The cables came to me after fellow SoundStage! writer Bill Cowen had already partially burned them in on some super-duper burn-in device. But even then, according to Coincident, they would need a good month or so of additional burn-in. I believe in reasonable burn-in time for any audio component, but months on end? I have found that most gear achieves full burned-in status within a month. After that, you are listening to air molecules collide and hoping to hear the friction. I found no significant sonic difference after having the Coincident cables in the rig for a month, taking them out for a week and then reinserting them. Once they were burned in, their sonic character seemed set. I began my evaluation with the CST IC interconnect, replacing the Harmonic Technology Pro-Silway Mk II I used (back then) between DAC and preamp (I used Cardas Golden Reference between the preamp and power amps). Playing Once You Wish Upon A Star by The Drummonds [32 Jazz 32204], I was instantly taken with the CST ICs clear, extended treble, as sharp and pristine as I have ever heard from a cable. The sound was never etched or hard, but very fleshed out, giving Billy Drummonds cymbals plenty of air and great stick-on-cymbal definition. This CD has fabulous, larger-than-life bass, and the CST IC handled it well, if a bit boomily. I also enjoyed the gobs of air that permeated the CST IC's representation of drums and piano. Decay on piano notes was good, and drums were crisp and sparkling. For some, this much treble energy could be a problem if anything else in the system is at all harsh, but in my rig it revealed tons of inner detail. Loudspeakers  Audio Physic Virgo, Revel Performa M20. Amplifier  Atma-Sphere M-60 Mk II.2 monoblocks. Preamplifiers  Blue Circle BC21 with power-supply upgrade. Analog  Oracle Alexandria turntable, Grado Platinum Reference cartridge, Camelot Lancelot Pro phono stage. Digital  Electrocompaniet EMC1 CD player. Interconnects  Cardas Golden Reference, Harmonic Technology Pro-Silway Mk II. Speaker cables  Cardas Golden Reference. Power cords  Shunyata Research PowerSnakes Black Mamba, Sidewinder, Mamba and King Cobra. Power conditioners  Shunyata Research Hydra. Accessories  Placette Audio remote volume control, Symposium Ultra and Svelte platforms, Salamander rack, Dunlop "Anna Kournikova Abzorber" tennis balls. Moving on to the naughty pleasures of the ABBA remasters, I played the band's final album, The Visitors [Universal 314 549 965]. Whether you care for the '70s pop of ABBA or not, you have to admire their lush production, which is quite breathtaking, involving not only a full band, but orchestra, layers of keyboards and voices, and, of course, the golden tones of singers Agnetha Faltskog and Frida. The pleasant peasant pop of "One of Us" features a full choir and a shower of mandolins threading through the song like a spiders web. Again, the treble was extended and glossy, coupled with the CST IC's excellent retrieval of detail. With the perceived treble emphasis, the plucked bass was very easy to follow, and the snare and toms were crisp. Low bass is not this cables forte. This is not a warm cable per se, so that is only a minor criticism, but system matching would be very dependent on the rest of rig given the CST IC's abundance of high-frequency energy. I mostly found myself enjoying the cables treble focus, hearing more detail than ever. This interconnect is very clean, but if you are looking for warmth, it aint here. If you love every iota of nuance and detail you can scrub from your system, the CST IC will do the trick. I also played John Scofields Uberjam [Verve 01157] and Steely Dans Two Against Nature [Giant 24719-2], the latter a very detailed and exacting disc. With both discs, I was struck again by the heightened sense of clarity and the treble energy. With the Steely Dan, there was decent soundstage depth, but the music sounded a little colder, even more than usual. Right as the 1s and 0s were drying on this review, Israel Blume informed Marc Mickelson that he had a new, revamped and updated TRS speaker cable available for review. Of course, we had to have it sent along as it was the current version of the cable. But dont expect me to do the burn-in shuffle again! Blume said to just give the new cable a week then hit it with your best shot. In terms of looks, the former and current TRS cable were identical. With the new-and-improved TRS speaker cable in and fired up, playing Louise Goffins forthcoming Sometimes a Circle [Geffen DRMF-13711], I heard even greater air and detail, but also razor-sharp delineation of midrange and low bass. Music became much more palpable, like the noise floor had dropped into the underworld. Things just snapped into greater focus. Little things like tambourine and hi-hat patterns were more easily heard. Goffins voice, recorded with close-miked L.A. sheen, was now dead-on accurate, very wet and warm. This sense of greater air also gave higher recognition of upper-mid-level bass, but absolute bass was fundamentally not different than with the original TRS. Soundstage depth also increased. Compared to what I heard with the slightly darker original TRS at the beginning of the review, I now felt like I was outside with the sun and wind at my back. Overall, more air, faster transients and a wide-open soundstage added greater value to the Coincident TRS speaker cable, but they also added the need for care in system matching. If you have garbage upstream, the TRS, like the CST IC interconnects, will surely reveal it. Going back to my Harmonic Technology Pro-Silway Mk II interconnects, I missed the dazzling, hyper-real treble of the CST IC, but I appreciated the improved bass slam, warmth, and more laid-back vibe. Overall, the CST IC bettered the Harmonic Technology interconnects with its fleshed out and highly detailed treble, though the lack of low bass could be a bugaboo in time. Ideally, the two cables somehow meshed together would have been a big winner. Removing the CST IC to retain system coherence, I kept the Harmonic Technology cable in, and replaced the Cardas Golden Reference speaker cable with the Coincident TRS. The Coincident's cables large gold spades (more inner prong-to-prong space than the Cardas) made hook-up a breeze. The sound with the TRS mirrored the sound with the CST IC in my system. The treble was just as brilliant, but the low end improved. The TRS cast a soundstage almost as wide and as layered as the Cardas cables. On "One of Us" again, the voices deliciously spread across the speakers; bass drum was very present and with excellent transparency. Yes, transparency in the midbass and treble is this cables thang as well. I reasoned that with both the CST IC and the TRS in use, the result would be massive treble hemorrhage, with my ears bleeding while I smiled with glee. But instead, the system sounded more coherent top to bottom. Low-level resolution improved, and better bass resulted when a CD offered it. Perhaps with the cable synergy, the noise floor was lowered, improving response in the bass and midbass. Still, the shimmering, detailed treble remained the duos most outstanding trait. With the Cardas and Harmonic Technology cables back in, I heard a better presentation of music in the non-hi-fi sense. The Coincident cables sometimes created a super-heightened sense of reality, which was at times intoxicating, but I am not sure how this would fare in the long term. Plus, the more expensive Cardas cables simply sounded warmer, more organic and slightly smoother. Now if I could have all the qualities of the Cardas Golden Reference with the Coincidents ultra-treble sensitivity and detail retrieval -- that would be the ticket. 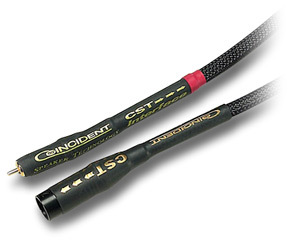 In a world of mid-fi interconnects that boast "no sonic signature," the CST IC interconnect offered focused treble and an ample dose of detail. I was very taken with the CST IC's ability to rescue every last shimmering fraction of information of percussive instruments and with the handsome sheen it imparted to everything else. Those with systems perceived as bright should steer clear of the CST IC, as it wont retrieve deep bass where none exists. And this is not a warm cable either. But all others in the market for a detailed interconnect should definitely give the CST IC a listen. I was just as thrilled with the updated TRS speaker cable, finding it open and highly resolving. But the speaker cable and interconnects together did perform some magic, especially for their cost. Again, both of these cables will require careful system matching, but with this caveat noted, the Coincident Speaker Technology line of cables deserves serious consideration -- a look-see and a "Waz up?" from all fellow audiophools. Prices: CST IC, $299 USD per meter pair; TRS, $1095 per eight-foot pair. Coincident would like to thank SoundStage! for commissioning and Ken Micallef for writing the positive review of our CST IC interconnect and TRS speaker cables. To maximize the sonic benefits afforded by Coincident cables, it is highly recommended that other makes not be used in conjunction with our cables in the same system. Doing so will not only yield unpredictable sonic results, but will undermine the inherent sonic characteristics of Coincident cables. It was interesting to read that Ken found our cables, particularly the CST IC, super detailed and possibly lacking some warmth. Most of the comments from Coincident cable owners indicate that while the cables are revealing, the owners are especially fond of their naturally full-bodied quality. I personally have never received any feedback indicating a desire for a warmer presentation. In fact, some customers have noted that, if anything, our CST ICs err on the side of being slightly too warm. Personal preferences and system synergy are obviously at work here. I will admit that Coincident cables are not as warm or soft as Cardas, for example, but that is intentional on our part as we feel that those sonic characteristics represent a deviation from neutrality. The Coincident philosophy that is applicable to all our products is to pass as much musical information with as little coloration as possible. Consequently, our cables will permit the listener to hear what his components, the source material and the room are contributing to the ultimate sonics of his audio system. It is precisely for this reason that many respected audio reviewers and manufacturers use Coincident cables when evaluating audio components. Coincident products do not glamorize or editorialize the signal being transmitted by them. Our goal at Coincident is to, as accurately as possible, replicate the original signal. And that signal not only includes detail but naturally occurring harmonics. Ken did a nice job delineating how special Coincident cables are.What further makes them unique is that state-of-the-art sound and quality is now available at affordable prices. Many have found our $299 CST IC to outperform competing cables costing up to five times the price. Our TRS speaker cable has been preferred to other cables in the five-figure price category. Many feel the TRS represents a sonic breakthrough in speaker-cable design. In a world filled with expensive audio cables, we designed and developed our cables for only one reason: to offer the consumer a state-of-the-art component at a reasonable price. We have not spent one cent on marketing our cables. In fact ,this review by SoundStage! is the first we have received for our cables. Therefore, for us to be successful, our product must be damn good. For the last year, we have experienced difficulty keeping up with demand. Coincident cable owners are our best salesmen. Nothing rings as true as unbiased, enthusiastic endorsement from a consumer who actually owns and uses the product.